Today is a day where it is hard to feel good about anything. Last night I called my dad crying, in despair about what my country has done. When I tried to think of reasons to get out of bed this morning, I took some comfort in the cozy world of Animal Crossing. I hated the town I grew up in. We were the only black family on an all white street. At my private school, me and my brother were two of about five black students. The two of us were unbearable nerds, following in the footsteps of my nerd father, who would gather us around the television to watch Star Trek: The Next Generation. Even as my brother fell into competitive Counter-Strike, we didn’t have the privilege of finding a community of nerds. Both of us, but especially me, were incessantly quizzed on our interests, as if our genetics would prevent us both from finding video games and science fiction interesting. I still identify as an outsider, peering through the window at experiences and communities I don’t have access to. The weight of that, even when I didn’t have the words for what I was feeling, crushed me. I was suicidally depressed at age 10. I was unable to understand the point of being alive, thinking that my family would be better off if I was dead. The year that parents grappled with this, they got me a Gamecube for Christmas, along with two games: Legend of Zelda: Wind Waker and Animal Crossing. Wind Waker, I never finished—I was a child, and the first boss I encountered frightened me so much I never played it again. But Animal Crossing was calm, kind, and pleasant. In Animal Crossing, you move to a town and befriend the animal villagers there. As a kid, I didn’t always grasp all the mechanics (I wrote many letters and my villagers hated all of them), but I found myself returning every day. I wanted to see how my town changed at different times of day, to see what insects were around in different seasons. I wanted to see what kinds of animals would move in. My parents were concerned about me playing video games too much, but they let me have this, because I needed it. I have not been as sad as I was when I was 10, but there are long stretches where I struggle to remember that beauty exists in our world. In Animal Crossing, those reminders are all around you. A few days ago, I returned to Dogma, my town in New Leaf. Butterflies lazily circled each flower I’d planted. I sent a nice message to Mint, my favorite villager. I bought a new shirt for the hell of it. These were small acts of self care—it made me happier to do them. Years later, deep in another bout of depression, my dad told me that every day he wakes up, stares out the kitchen window, and tries to think of all the things he is grateful for. The kitchen of our family home overlooks a modest backyard with a few trees and a creek lousy with mosquitos. My mother was, and still is, an ardent gardener and on our back porch she grew basil and lavender. Looking out on that, my dad would think about how he loved his family, his job, and the place he lived. 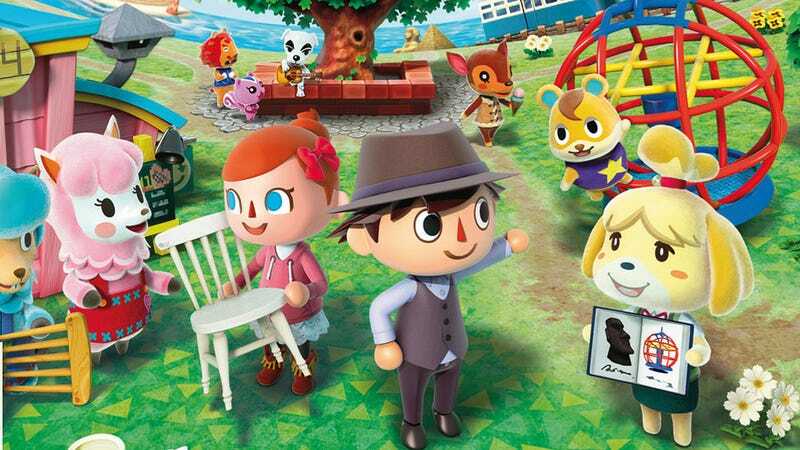 It seems absurd to say, but I have appreciated more things the way my father does because of Animal Crossing. When I was a child it helped me realize that small moments of joy are always around me, even as an outsider looking in, and today I need to remember this. There are days when I am walking alone in the city, downtown, where it is crowded and smelly and dirty and I feel myself wallowing in negativity. But in Animal Crossing, even on rainy grey days, the sky is beautiful. You have no choice but to see it, the top screen of the 3DS is completely full of sky. So on those days, downtown, I remember to look up. Every time, I am struck by how lovely my city is, the way the sun filters through those tall buildings, or how the mist hovers around them, or even a bit of architectural detail I hadn’t noticed before. Video games transport players to new worlds, where they can be whatever they’d like. It’s an escapist quality that can make some video game fans myopic: I’ve had conversations with people whose primary concern during the election was Hillary Clinton’s record on video game censorship. My friend Max refers to this as “video game blinders.” There’s something so seductive about this medium, that some people consider video games the most important thing in their lives. Even so, escapism is still valuable. In times that are painful, like today, you will need to find a soft, warm place to lay down and rest. You can’t be at one hundred all the time. Sometimes you do, actually, need to check out. In Animal Crossing, there are no urgent quests flooding your UI—just the quiet town you built, the people who live in it, and you. It’s easy to forget, in hard times, that looking at flowers can make you feel peaceful. It’s easy to forget that standing in the shade of a tall tree can make you sigh with relief on some days. In Wild World and New Leaf, there’s a cafe in town called The Roost. The only thing you can do there is drink a cup of coffee. The game will show you a brief animation and tell you how the coffee tastes, what strength or notes or flavors it has. There is no real purpose to The Roost. But haven’t you had days where that first cup of coffee made the world come into focus? When I visit my town, now, I make a list of the things I want to do while I play it. I fish, collect fossils, give gifts to my villagers. Then, when I am finished, I look at the list I make for my life, and I feel the same joy in accomplishing those small tasks too. Today, I might buy a new shirt for the hell of it. On the weekend I take walks, I look at trees, look up at the sky. I think about the things I’m grateful for. Animal Crossing reminds me of just how many there are.